Admit it. You think this is a great question, too – which is why I am sharing my answer with you! Here’s the hard truth. When you are just starting out your blog, you are excited. You have motivation and the ideas seem to flow freely. Over time, you lose excitement for your blog, and as it becomes one more thing on your never-ending “to-do” list, you may even begin to dread sitting down to write. Then there are the dry-spells where your brain just won’t cooperate, and yes, even the most seasoned writers suffer from writer’s block and just can’t think of something new to write. And then there is something we all suffer from: life-interuptus.This is where even your best intentions get sidetracked because of a client issue that needs your immediate addition, a sick-day or you are in desperate need of some down-time and want to completely unplug from from your business for a few days. For all of these reasons, this is why I recommend having an article inventory. Please resist the urge to publish all of them immediately. It is only natural that when you first start your blog, you are excited and the ideas come easily. But be strategic by saving some of those article for a time when you simply can’t find the energy to write … or you are sick … or there is a client emergency … or when your brain won’t cooperate. Those are the times when you pull out an article from your inventory and publish it. How many articles should I have in my inventory? The number of articles you hold in inventory really depends on how often you publish. 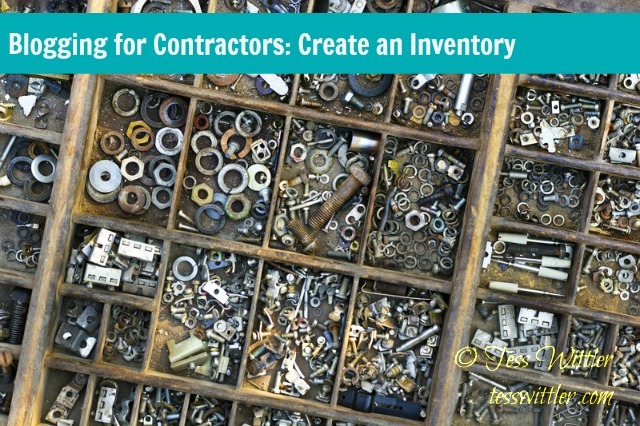 Most contractors and suppliers publish to their blog once a week, so having five or six articles in inventory should be sufficient to get you through vacations and times in business when you are already putting in long days. Personally, I have about 20 articles started and stored in my Google Drive. I also use Trello to keep ideas and partially-written articles organized. This way when I need a topic, I can go to Trello to see what’s drafted and then finish up an article so I can publish it. Whether you are just starting your blog or are a seasoned blogger, keeping a small inventory of articles for those busy times will go a long ways toward building a successful blog. This means that even though you’re busy, your blog is still generating leads for your business and staying connected to your existing community. 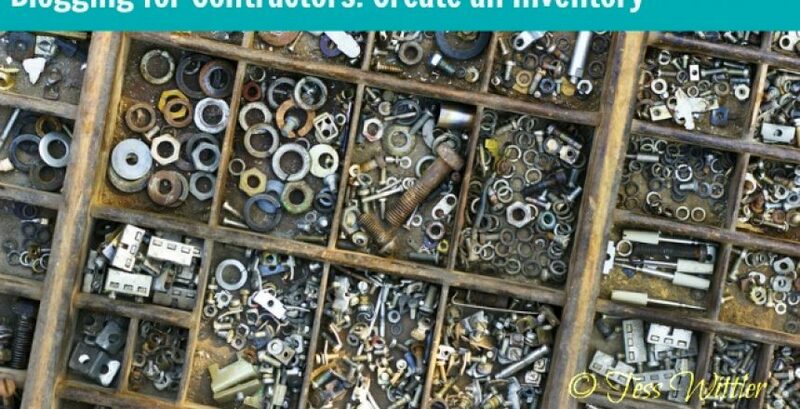 If you want blog article ideas, download my free e-book, 52 Content Ideas for Residential Contractors. Great article. Thanks for Sharing it!!! Thanks Tess! I feel so much better about all those draft posts in drive! 😉 I’ll have to check out Trello, what else do you use it for? Trello organizes my business life! I have several boards. Some organize big projects (Parade of Homes, International Builders’ Show) and others that hold my “Business Blueprint” which are various resources that I use/refer to regularly, such as workflows (blog checklist, client checklists), courses/memberships (so I don’t forget about them). I found these folks: http://academy.thinkcreativecollective.com/ and spent the $29 for their “Trello for Business” and it was worth every penny!